Pleased to announce a series of music sessions at Brel in Glasgow throughout December. 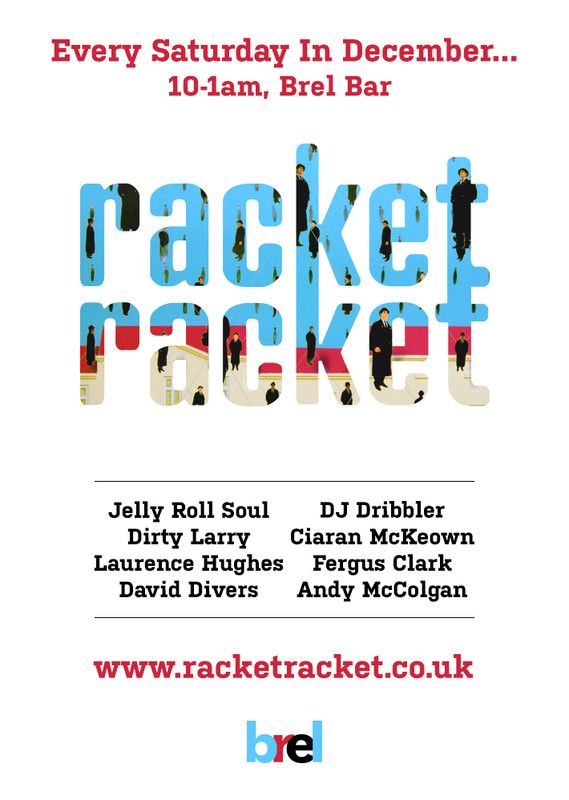 Racket Racket and friends will be providing the musical backdrop to your festive (or otherwise) Saturday night drinks throughout the month. 10-1am. Join us for the ride. The musical vibe will be Saturday night party listening from around the world and across the board. Anyone who keeps an eye on the site will know what we mean. A mixture of some classic and some overlooked pop beauties balanced with unknown diamonds and gems, taking in disco, Afro, house, J-pop, soul, boogie, yacht rock, soft rock, funk, skiffle and the like with a whisper of the psychedelic and a hint of the cosmic for good measure. Quality dance records, basically… to get you in the mood. And who knows what the future holds. Fingers crossed for more of this sort of thing in 2016. Visit the Brel website here and find ’em on Facebook and Twitter too. Tasty grub with a Belgian vibe, great selection of beers and one of the best back gardens and courtyards in the city. What more could you ask for? Poster artwork – a shameless homage to (stolen from) Belgian great Rene Magritte’s iconic Golconda from 1953 – designed by all-round good egg, Sir Tam Wilson. Gracias amigo.